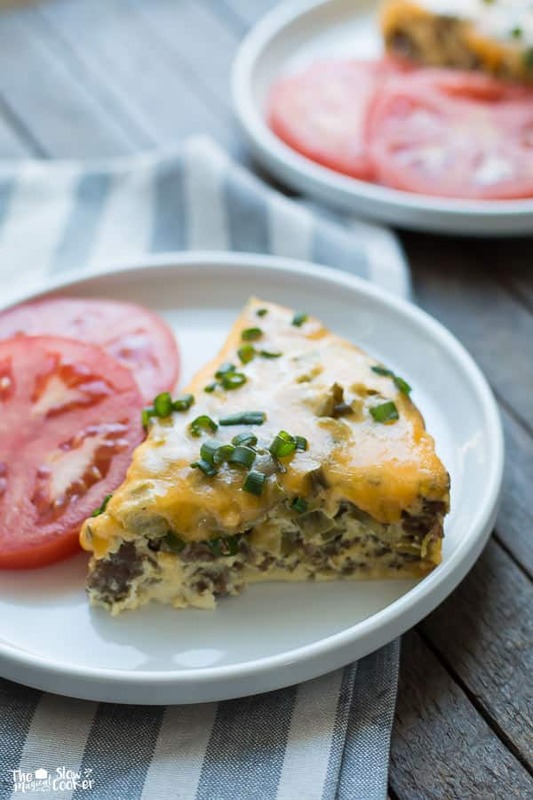 For breakfast or brunch this Slow Cooker Sausage and Green Chile Breakfast Casserole is a crowd pleaser! 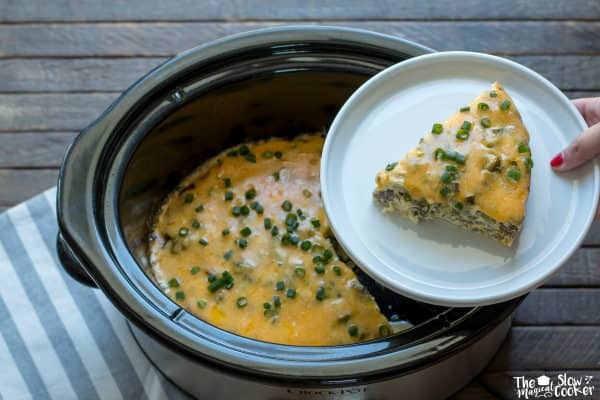 Have you ever made a breakfast casserole in the slow cooker? I have tried a few, the overnight crock pot egg dishes don’t turn out well for me, burnt and stinky by the time I wake up. Not something I want to serve to guests. This casserole takes only 2 hours and 15 minutes. Turns out moist and perfectly cooked. If you want to make this for breakfast and you are not an early riser, brown the meat the night before, and prep everything else as well. When you wake up you can put this together with your eyes closed. I want to save you from overnight egg disaster, do not try to cook this overnight. I use sour cream instead of milk for the liquid in the egg mixture. It makes these eggs extra creamy and moist. Below is what the casserole looks like after cooking, then a bit more cheese and green onions added. I served this with sliced tomato since I am trying to cut my carbs. But this would be good with an English muffin or toast! We ate this for 2 days, the leftovers were just as good as the first day! I used my 6-quart oval slow cooker for this recipe. I have not tested this recipe with a tall round crock pot yet. 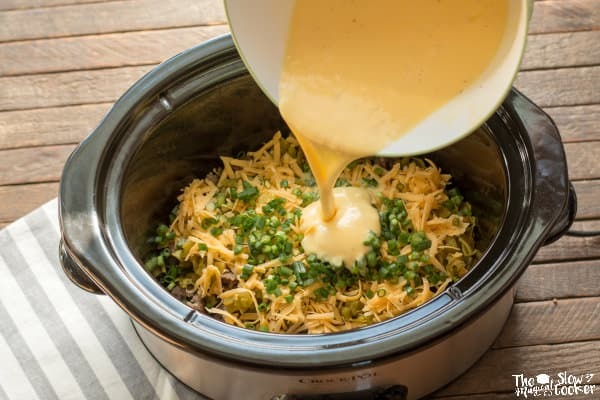 If you use a round crock pot for this recipe, let us know how it turns out for you! Have a great week! 2 (4-oz.) cans diced fire-roasted green chiles, DRAINED VERY WELL! Spray the slow cooker with non-stick spray. Place cooked sausage down in an even layer. Then sprinkle over 1 cup of cheese, green chiles and green onions. In a large bowl whisk together the eggs, sour cream, salt and pepper until smooth. Pour this mixture over the ingredients in the slow cooker. Cover and cook on HIGH for 2 hours and 15 minutes. Do not open the lid during the cooking time or you will risk the eggs not setting up correctly. After the cooking time is done add the remaining 1.5 cups of cheese and cover for about 5 minutes, or until the cheese is melted. Sprinkle with additional green onion if desired and enjoy! I haven’t had great success with slow cooker egg casseroles. I love the changes you made especially the cooking time. Yours looks like it is exactly what I am looking for. 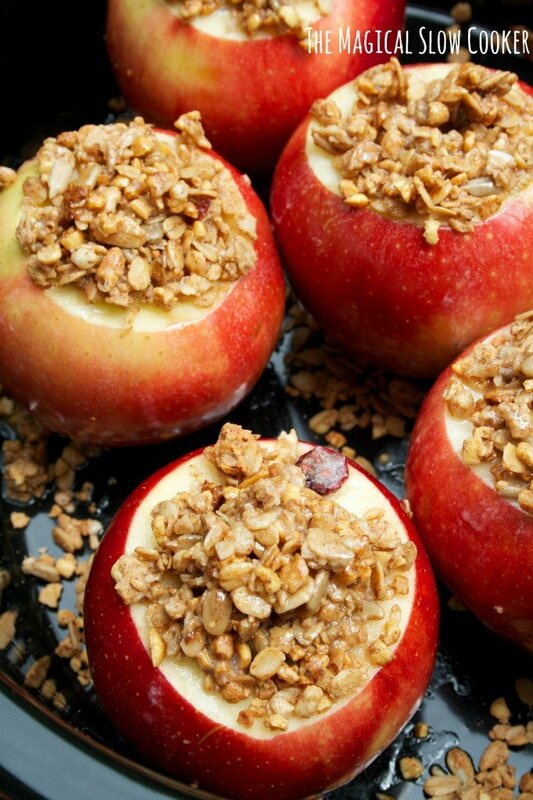 I am always looking for something new and yummy to take to the teachers appreciation breakfasts! Thank you. This. Looks amazing. LOVE green chilies and I love every sausage and egg casserole that I have ever had. Will definitely be giving this recipe a try. 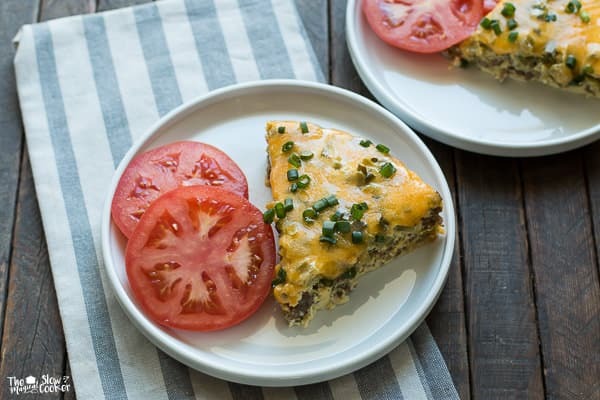 I agree with you- those overnight slow cooker breakfast casseroles usually end up being a disaster for me too, lol. 😉 Love that this one can be made in a little over 2 hours. It looks delicious. This is a great breakfast to serve when I have all the family over. Everyone eats at the same time and I get to visit as well! Can’t wait to try this! can you use fat free sour cream??? can you add hash browns to the mix? If so, would i need to adjust anything else? You could, but it would need more seasonings. Would it be ok to not drain the green chiles? Yes, only because I remember the chiles not having too much liquid. Has anyone tried doubling this? If the Susage is brown the night before, how much do I adjust the cooking time in the crock pot?